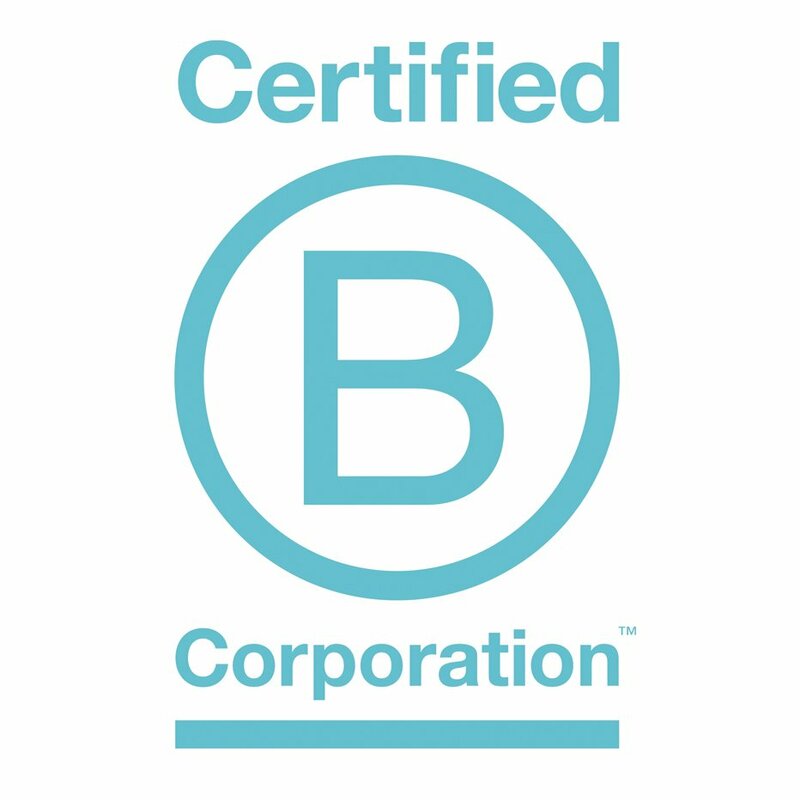 Frogsong Farm is proud to be a Certified B Corp. Have you seen this logo before? 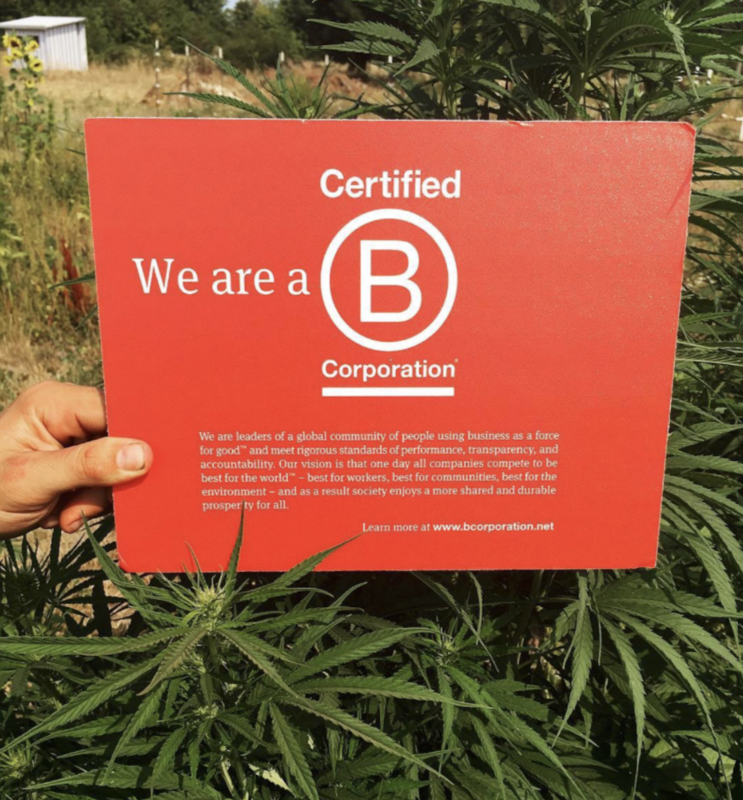 This “B” is a sign that a company has proven their commitment to using business as a force for social and ecological good. Certified B Corporations are redefining success in business: we only succeed when all stakeholders benefit. This includes our employees, our community, and the environment. You can Vote Every Day for companies that align with your values and are producing authentic good in the world. Look for the B Corp logo next time you shop. This month on the blog, we’re exploring different aspects of the B Corp ethos. 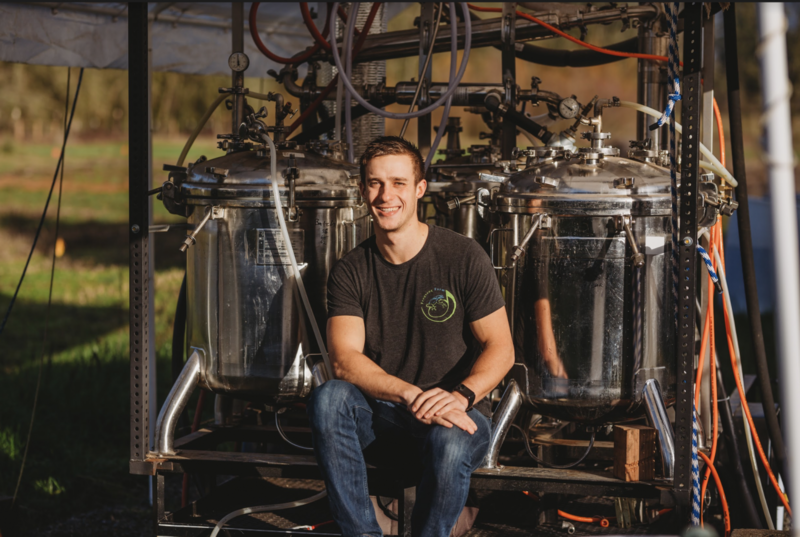 Today, we talk with Reid Adams, lead extractor at Frogsong Farm, about the company’s vision for a no-waste future. Conservation and waste reduction are matters of concern for all of us in this day and age, whether we realize it or not. We’re in an unprecedented time. The modern world’s go-go-go pace of daily life, and the nonstop consumption of material things have created a global crisis. Much of what consumers buy is designed to be used once or twice, then thrown away. In reality, there is no such thing as “away”… waste is simply displaced into our oceans, landfills and the atmosphere. Nearly everything that is bought is made with or wrapped in plastic (which is made from fossil fuels): toys, drinks, foods, electronics, clothes… the list goes on. And because plastic is so inexpensive to make, consumers use it and throw it away. Then it is forgotten about and the process begins again. 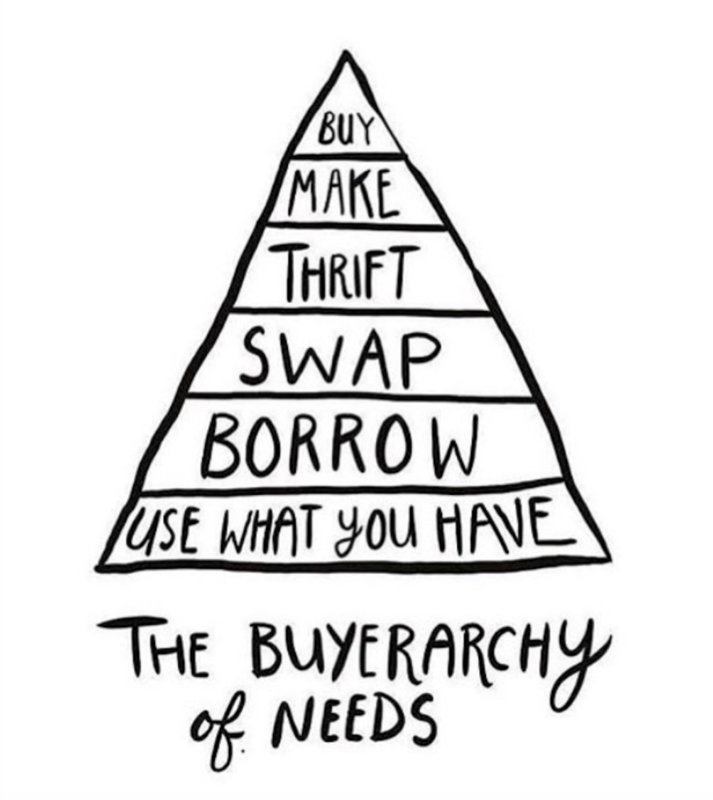 The “Buyerarchy of Needs” coined by Sarah Lazarovic, is a useful reference point for creatively meeting needs while treading lightly on the Earth. In the 90’s, the famous motto “reduce-reuse-recycle” came into our collective consciousness. Perhaps we have overlooked the REDUCE and REUSE aspects – perhaps it was most convenient for our existing systems to opt for RECYCLE. But we have learned that recycling plastic is not only energy intensive, it is really just slowing down the journey to the landfill. The best way to break this cycle of disposability it is to produce less waste in the first place. Ultimately, conservation and waste reduction require that we slow down; we can’t create solutions in go-go-go mode. Course-correcting requires that we thoughtfully examine what we’re doing and why, and how our actions affect the world around us. How do our actions affect our world’s resources, and our future? What are the trickle-down effects of high-waste business practices and lifestyles on the rest of the planet and its diverse array of inhabitants? There is physical waste, energy waste, and what we consider emotional waste: depletion of our inner resources without benefit. Here at Frogsong Farm, conservation is one of our core values. Our company’s approach is rooted in sustainability, efficiency, and continual improvement. Everything we do is done with the aim of leaving the smallest possible environmental footprint, while creating the greatest positive impact on our community and natural resources. 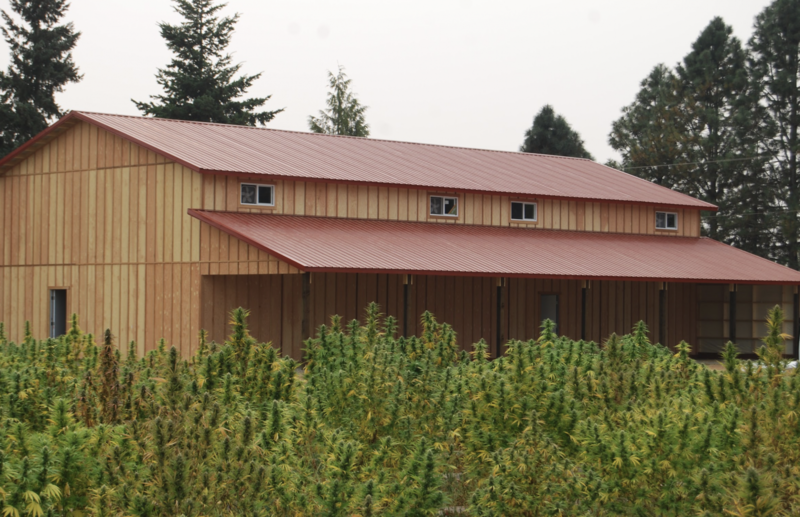 The view of the barn from our main hemp field. We are far from perfect, and there are always areas in which we can improve. This gives us an even stronger sense of purpose. We want to be a thriving company in 100 years, which means the day-to-day decisions we make must be based on their trickle-down effects, both immediate and in the future. When looking at any aspect of the business from a conservation standpoint, we ask ourselves first: is this necessary? Next, is there something we have that can be re-purposed or reused? And last, if we determine that we do need something new, can we source it from a local, sustainable company that shares our ideals? Of course, being the imperfect company and individuals we are, we can’t always answer yes to all these questions. When that is the case, we try to be cognizant of the waste we are creating and always look for ways to cut back or eliminate it however we can. From a materials standpoint, we package all of our products in glass containers that can be recycled (glass). We try to use only environmentally friendly toner for our print materials. We only use biodegradable shipping peanuts and recyclable boxes, and we plant our hemp seeds in biodegradable pots rather than plastic. 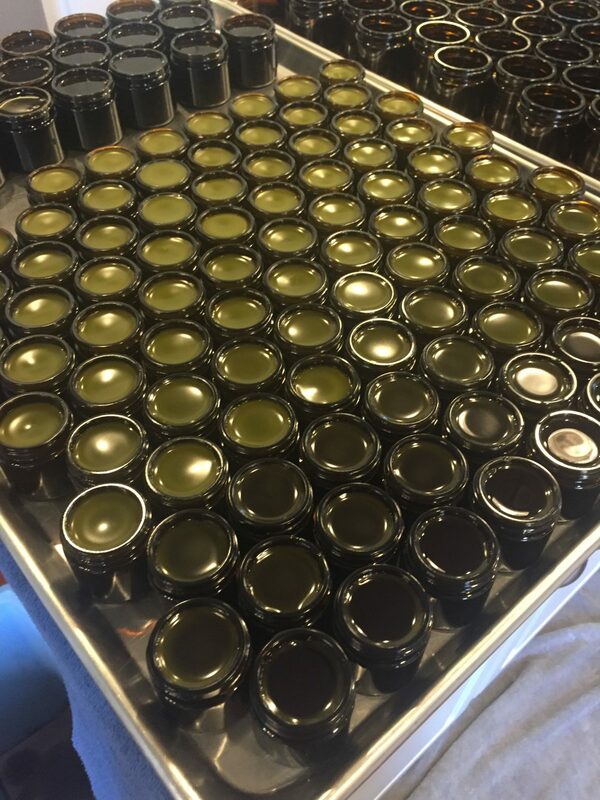 A big batch of Rubbit salve. Shea, coconut, and argan oils mingle with full-spectrum CBD extract and an enticing blend of essential oils for a luxurious pain-relief experience. Energy efficiency is another big area of emphasis for us. The CBD extraction process is somewhat energy intensive, as it consists of lots of heating and cooling. By designing and building our own equipment, we have been able to maximize our throughput and energy efficiency. For example, we are able to recover and re-use roughly 90% of the organic ethanol used in our extraction process. Some companies lose as much as 50% of the ethanol/solvent they use with each extraction. After our hemp is extracted, the plant material goes back onto the land to fertilize next year’s crop. No part of it goes to waste. 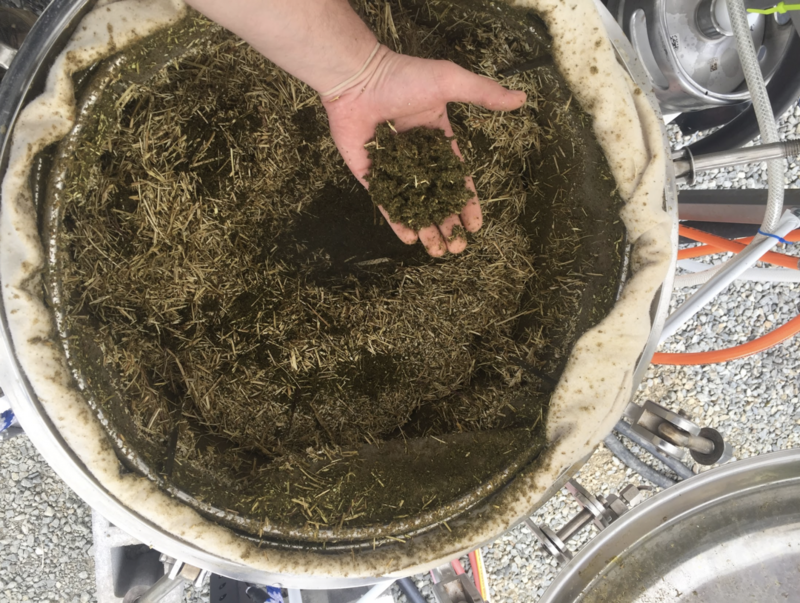 After extracting the CBD from our hemp flowers, we compost the used biomass and return it to the soil. This closed-loop system reduces waste and maximizes benefit. Last but certainly not least, at Frogsong Farm it’s important we consider our emotional and personal resources. This affects our relationships with our employees and our customers. Within our company culture, we seek to create a positive environment where people want to spend their time. Many people spend more time at work than they do with their families (luckily for us, this is a family business.) No one wants to be in a place where they are unhappy or wishing they were doing something else. We know that happy, enthusiastic people do the best work, and more importantly they live better lives! So here at Frogsong Farm, we make an effort to center our business culture around the sense of family, and the idea that everyone’s viewpoints are valued and welcome. We encourage and cultivate personal growth whenever and wherever we can. 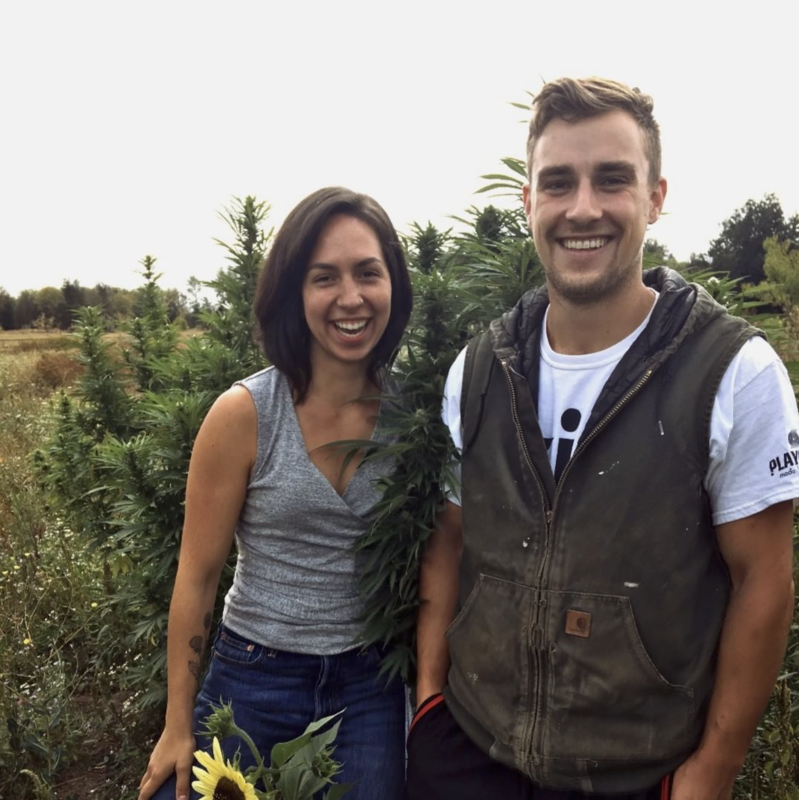 Sales Lead Becca Recker and Lead Grower Brett Adams having a good laugh in the hemp field. We can’t explain how, but we’re pretty sure this makes for better CBD products. We aim to make the highest quality CBD products available for people who are in pain, distress, or looking to bring some type of balance to their lives. Our goal is that every single time a person buys and uses our product, they feel they have received something of real value. 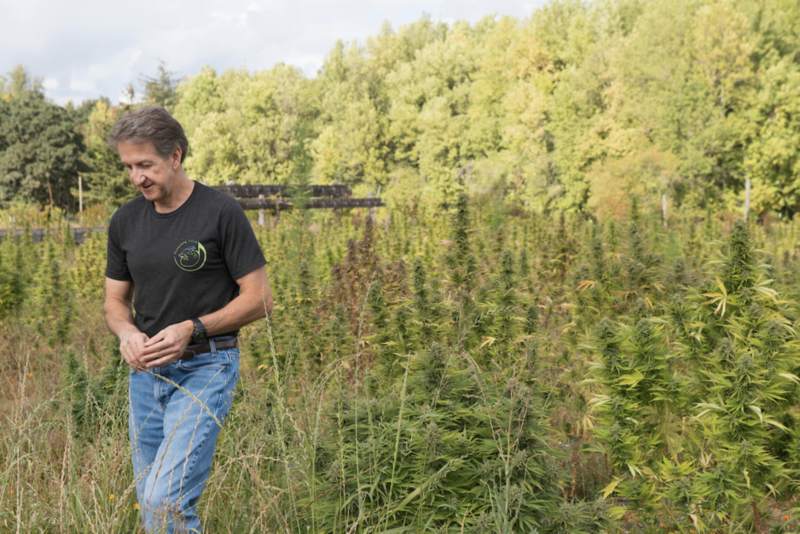 Offering consistent, high quality, effective products honors all the resources that go into Frogsong Farm: the land, water, soil, hemp plants, equipment, fuel, ingredients, labor, emotions, and energy. 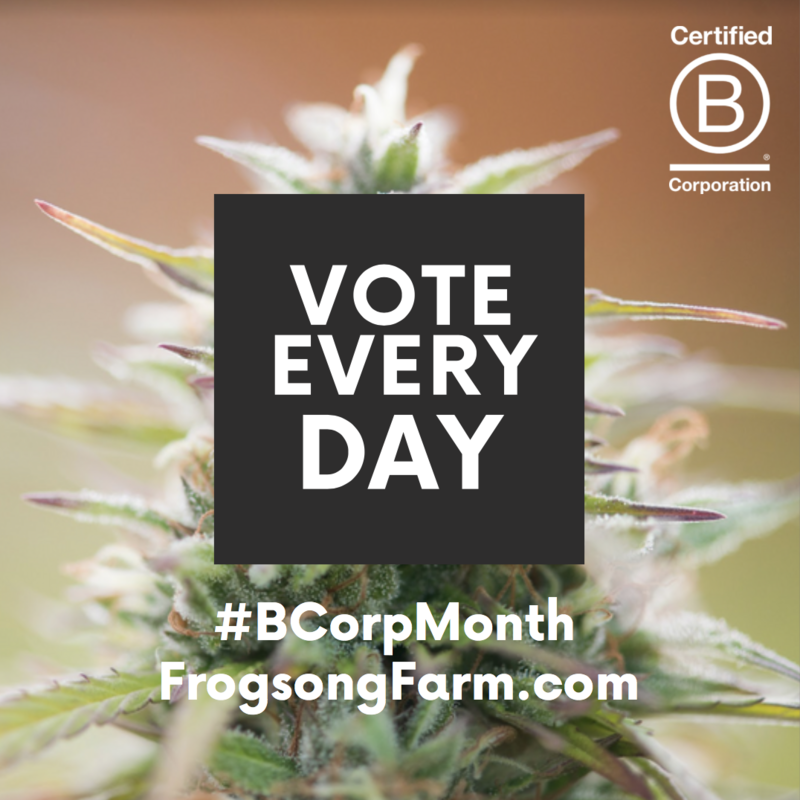 Frogsong Farm is proud to be the first Certified B Corporation in the CBD & Hemp sector. Our big vision is to become a waste-free company, meaning we are not sending anything to the landfill, and neither are our customers! Everything we use would be either compostable or recyclable. From there it would be ideal to examine the companies we partner with and essentially vet them to see what type of waste and garbage they are creating. In this way, we would be approaching a Zero Waste model, while also supporting other businesses in their Zero Waste efforts. We invite our community to join us in this vision for a waste-free future. Where can you reduce waste in daily life? What habits can we shift to conserve more of our precious resources and make sure we have a thriving planet to pass on to the next generation? What do we need to do on a larger scale, collectively, to work toward this goal? It’s our privilege to be your hemp farmers. Your support enables Frogsong Farm to continue improving, and contributes in a small way to sustainability and a cleaner, brighter future for all of us. Happy B Corp Month! Remember, you can Vote Every Day for businesses leaving the world cleaner, healthier, and more equitable. Shop local. Shop sustainable. Look for the B Corp logo next time you shop. This entry was posted in Education, Interviews, News, People, Products, Uncategorized and tagged b corp, b corp month, best cbd brand, better business, cannabidiol, cbd, cbd company, cbd extract, cbd extraction, certified b corp, conservation, family farm, farming, frogsong farm, hemp extract, hemp farming, hemp oil, how to find cbd, local cbd, low waste, Oregon hemp, organic hemp, permaculture, sustainability, zero waste.